The classic rickshaw is a two or three-wheeled cart used to transport one or two passengers. Powered by a human on legs (cycle and auto rickshaws don't count), the pulled rickshaw was once an inexpensive and popular mode of transportation. Its invention also created many job opportunities for male laborers in the late 19th to mid-20th century across many Asian cities. There are several theories about how the rickshaw came about, and the most popular one has it that it was invented by Jonathan Scobie, an American missionary to Japan, in order to transport his invalid wife through Yokohama's streets. Though the rickshaw's origins are not entirely clear and the topic remains hotly disputed, it is most widely accepted that it came out of Japan and was invented in 1869. In 1870, the Tokyo government started to issue permits for building and selling rickshaws. Just two years later, some 40,000 rickshaws were already in service, replacing palanquins to become the main mode of transportation in Japan. Japanese rickshaw manufacturers went on to produce and export rickshaws to other Asian countries. By the end of the century, the rickshaw arrived in China, India, Hong Kong and Singapore, where it became popular almost instantly, changing the traffic on the streets. 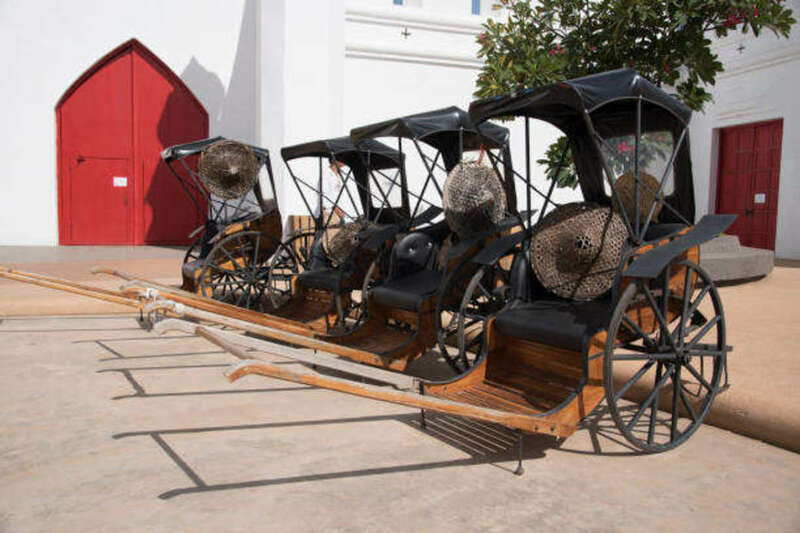 The rickshaw was also introduced to South Africa and Pakistan, although it did not make as big of an impact there as compared to Asia. Apart from the ascent of automobiles and the invention of cycle and auto rickshaws, another reason for the rickshaw's decline was the poor conditions that rickshaw pullers had to endure. They worked extremely long hours for very poor pay, and many of them lived on the brink of poverty, with the rickshaw serving as their mobile homes. In Singapore, the income for rickshaw pullers remained unchanged for fifty years, at a meager 60 cents per day. After World War II, the role of rickshaw pullers as 'human horses’ became increasingly frowned upon. Mao Zedong also placed a ban on rickshaws during China's Communist era, as he viewed them as a symbol of oppression against the working class. Where Can I Find a Rickshaw Today? The only place where you can still find a large-scale rickshaw operation is in Calcutta, India, and even there the cycle rickshaw is more common than hand-pulled ones. Although many human rights organizations have voiced their disapproval, the locals believe that a ban of the rickshaw would cause widespread unemployment and starvation. The traditional rickshaw can also be found throughout Japan as a cultural experience for tourists. These modern rickshaw pullers are also tour-guides, who take tourists to popular spots and provide running commentaries. Many of them are part-time working students who like to exchange cultures. Although you'd be hard-pressed to find the traditional rickshaw today, cycle rickshaws and auto rickshaws are still a common form of transport, especially in many parts of Southeast Asia! Follow our Facebook page/ Instagram for more great content! Or try one of our cultural experiences on Culturally today! Have you been on a rickshaw lately? Share in the comments section below!